LIFESAVER® systems was founded by Michael Pritchard in 2007. He was inspired to Invent the company's first product, the LIFESAVER bottle, after seeing the tragic waste of life and serious problems caused by the lack of safe drinking water in the wake of the tsunami in December 2004, and then again the following year on August 29, 2005 when Hurricane Katrina hit Louisiana. Michael felt he had to do something. It took a little while (18 months to be exact) and some very frustrating prototypes but eventually he did it and LIFESAVER was born. 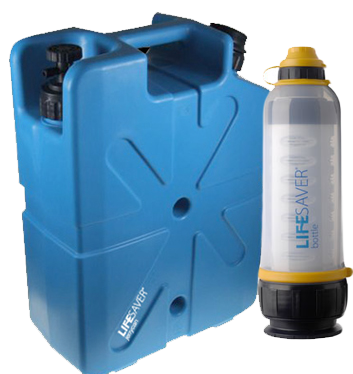 LIFESAVER Systems are a British Company. We Invent, Design & Manufacture all of our products in Great Britain. We serve 3 main markets: Humanitarian, Leisure & Military. Our products are shipped to all corners of the world. Our customers and users range from canoeists paddling up the Amazon, Haitian families recovering from the ravages of the 2010 earthquake, soldiers scavenging water in the green zone in Afghanistan and kids on gap years abroad. Around the world, LIFESAVER systems have helped hundreds of thousands of people produce safe sterile drinking water. Mother Nature has the perfect water delivery system, the clouds! They pick the water up from the sea, desalinate it, transport it 100's of miles across land, and deposit it on the mountains and in the rivers and streams, at no cost. And where do people live? Near water. All we have to do is make that water clean. How do we do this? Simple! All LIFESAVER products can do this. They are currently helping millions of people around the world, taking them out of water poverty for good.